The small headstone has been broken at some point and repaired using a steel support. It bears the year 1682 in error. William Graham was visiting the home of his mother when the soldiers under John Graham of Claverhouse approached. He tried to escape and was pursued for some distance before he was shot by the soldiers. Some say that Claverhouse himself shot him with his pistol. It was 15 March 1684. 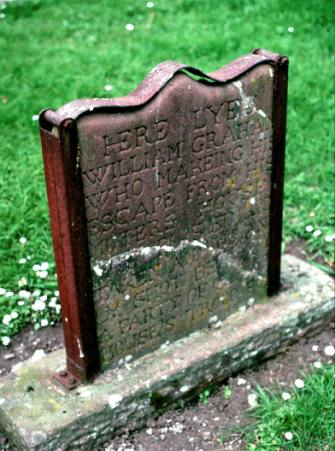 William's brother, James Graham, a tailor in the village, was executed in Edinburgh on 9 December 1684.